You may have noticed that I have been MIA for the last couple weeks, posting sparingly, watching no movies. That's because I have been finishing a project almost two years in the making. The short version is that I live in a historical town, more than most even. My hometown is Clinton, Tennessee. It is a city of about 12,000 situated in the Tennessee Valley between the Great Smoky Mountains and the Cumberland Plateau. 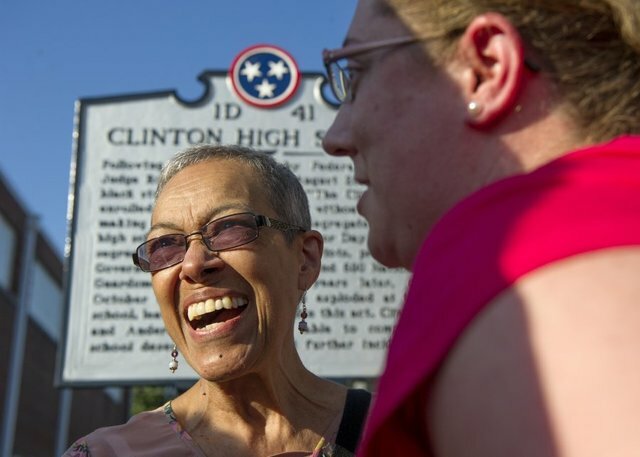 A suburb of sorts to nearby Knoxville, Clinton has had its share of national recognition of late. We got a visit from President Obama last winter. Filmmaker Quentin Tarantino was born in Knoxville and raised in Clinton for the first six or eight (not quite sure) years of his life. 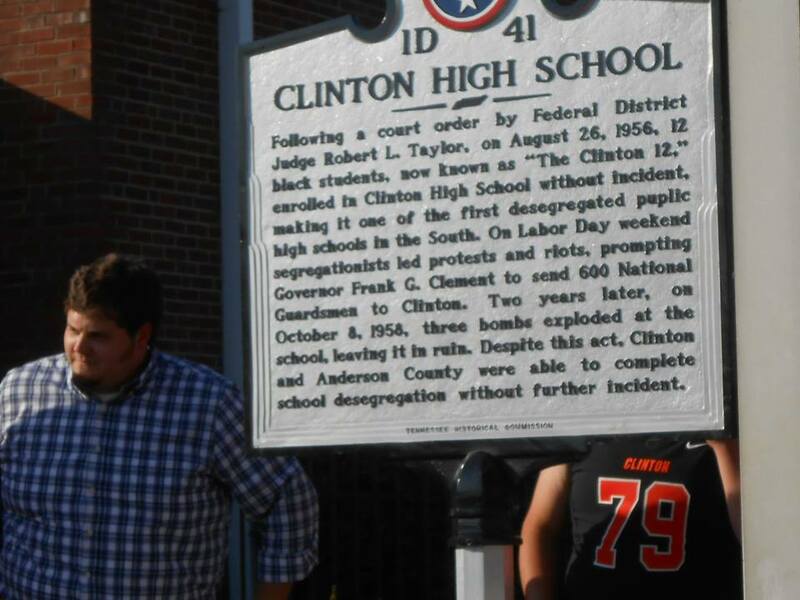 But most importantly Clinton is home to Clinton High School (my alma mater), the first state-sponsored public school in the South to desegregate after the historic decision of Brown v Board of Education. In May of 2014, my wife and I set into motion a plan we'd been concocting for awhile. The idea was to apply for a Historical Marker, which would register the building in which we work (formerly the high school, now the middle school) as a place of historical significance. 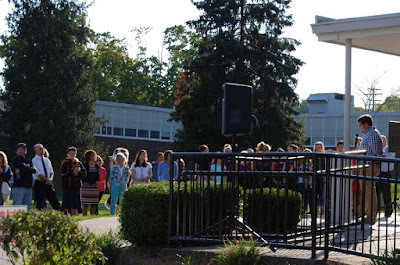 We had just the right help for the job, a class of 26 7th grade Advanced English students (my 5th period class). Together, we researched the history of our town and our building, wrote a proposal to the Tennessee Historical Commission, and succeeded. Over the past six months, I've been trying my best to raise money, get the word out, and plan an unveiling ceremony. I am happy to say that after much hard work from not only myself but my wife, Amanda; my colleagues at CMS; my wonderful past students (now high school freshmen) who wrote this proposal with me; my incredible current students, who gave everything in getting the project heard about; and my community, who showed up, got excited, and who want our town's story on the map. The basics of this story are this: In 1955, just after Chief Justice Earl Warren and the land's highest court called "separate but equal inherently unequal" and demanded public school desegregation "with all deliberate speed," the McSwain's and several other Black families of Clinton, Tennessee, filed suit in the Federal District Court of Judge Robert Taylor to allow their children the right to attend their hometown high school. Clinton did not have a "colored" high school. 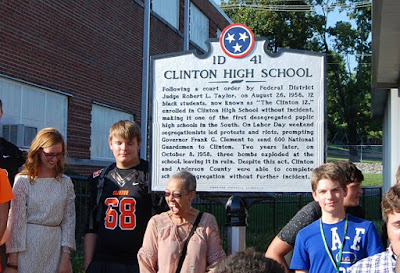 The only all-black school in Clinton stopped at 8th grade, so the high school age kids were bussed 30 miles to Austin High School in Knoxville. 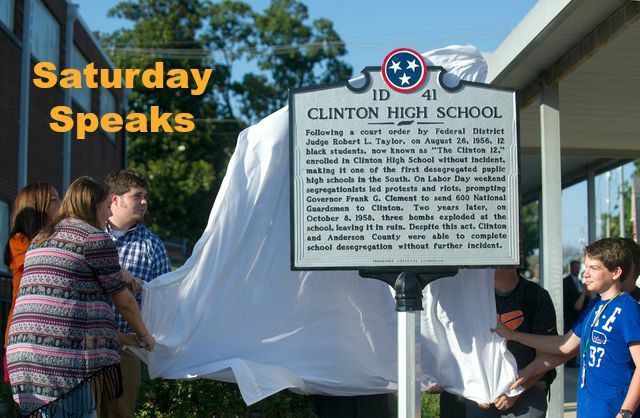 Following the Supreme Court's order, Judge Taylor decided in the interest of Clinton's black families and ordered Clinton High School to enroll these students. 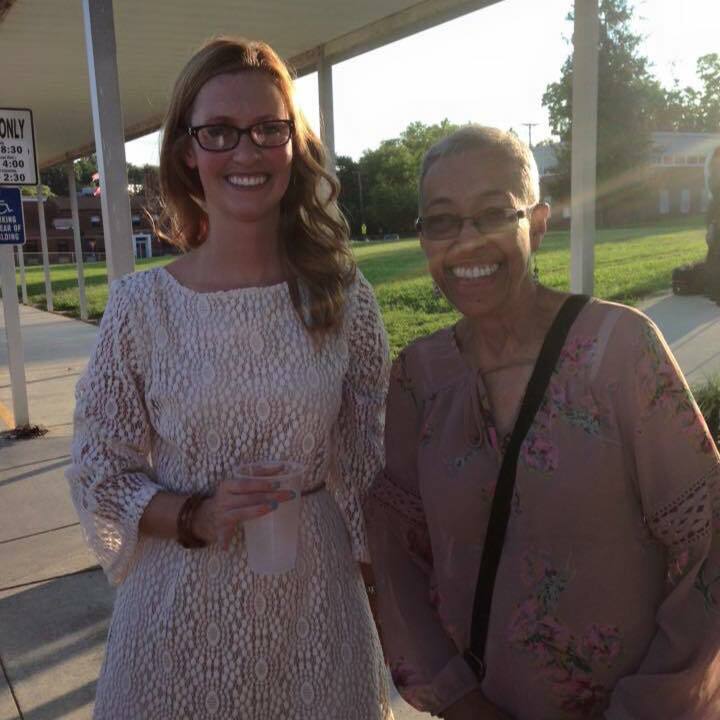 My wife, Amanda, and JoAnn Allen Boyce, one of The Clinton 12. 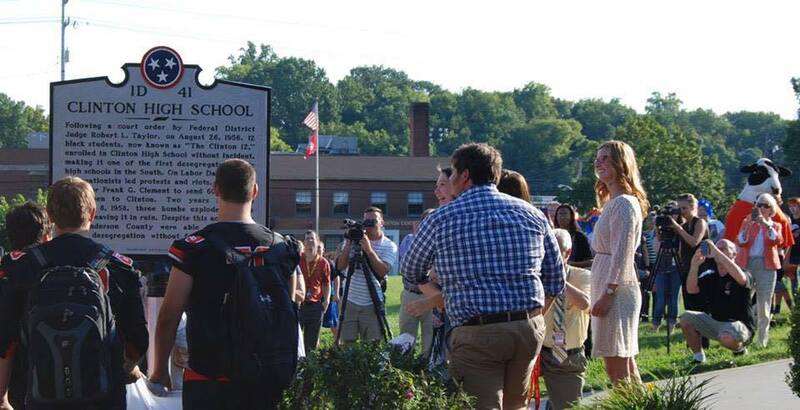 The twelve students, now known as The Clinton 12, entered Clinton High School for the first time on the first day of school, August 27, 1956, without incident. However, the following weekend a white supremacist named John Kasper came to town, stirred up hate, and basically brought mayhem to an otherwise law-abiding small town. 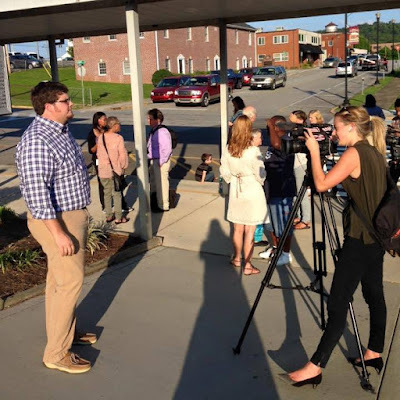 Of course, this brought in all sorts of outsiders and news media and the national guard, which, at one point, declared martial law and overtook the town. Walter Cronkite and Edward R. Murrow did news specials on Clinton. 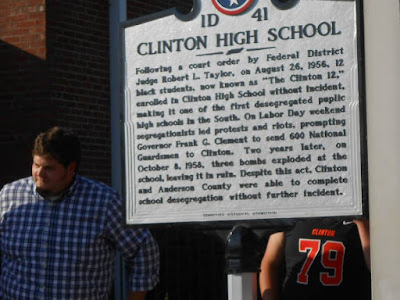 And two years later, in 1958, the school was bombed early on a Sunday morning, left in ruin, only to find that the people of Clinton would not be shaken. No. 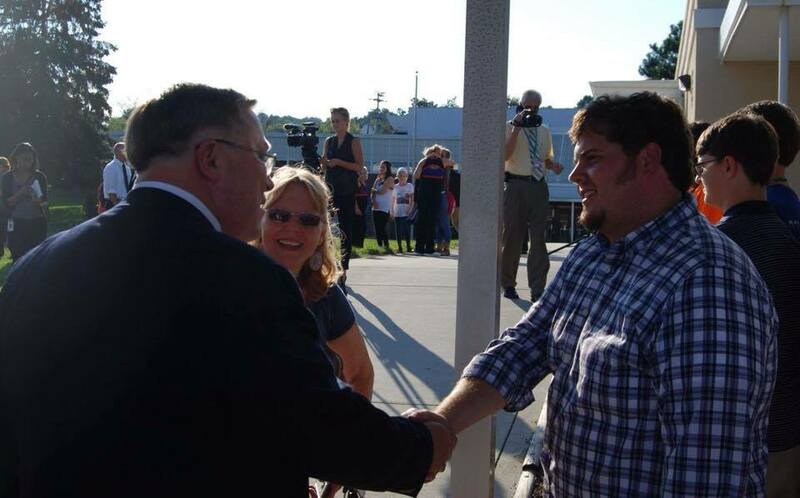 They would pick up the pieces, rebuild, and keep the first integrated high school alive. Now, I'm betting you had no idea this happened. You probably thought Little Rock was first. Of course, it is equally important. But we want people to talk about Clinton. So, I ask you, my readers, to take in this information and help tell this story. I want everybody in the country to know about it. The Clinton 12 headed to school in the Fall of 1956. Here's the introduction to our Go Fund Me page and what became our press release. I couldn't be more proud of my town, my students, my wife, everybody involved. Thanks to all. Great write-up on Roberto Rosselin's Stromboli over at Defiant Success. Dell at Dell on Movies talks the beginnings of Spike Lee. Dan at Dancin' Dan on Film Blind Spots The French Connection. Allie at Flick Chicks reviews my favorite film of 2013. Fisti at A Fistful of Films gives his awards for the year 1988. This is beautiful, man! BEAUTIFUL! I'm in near tears right now. Such a selfless act, my friend, and so important and rich with universal meaning. Oh, thank you so much, Drew. That means a lot. And I'm glad this story touches you, as it is so powerful in my life. Share this story with people you know, not just around the blogging world, but in your own life. I want the world to know of The Clinton 12. Congratulations!!! This is HUGE! I had no idea about Clinton. Thanks to you and all who helped for doing this and bringing it to the attention of many others. And thanks for the link, but that's not important in the grand scheme. Thanks! It is certainly a huge deal and a story I want told. Look into it, man. There is some information about The Clinton 12 here and there on the web. I want everybody to know my town's story. Thanks again! And no problem for the link. I feel like I've neglected the movie blogging lately. Trying to get caught up. This is wonderful, Kevin! I'm so happy you all were able to accomplish this and help spread the word. You're right, I didn't know about the history before. I'm glad I do now. Thanks, Britt! So glad I could share this. Congratulations - and kudos on finding a PERFECT project for that English class! 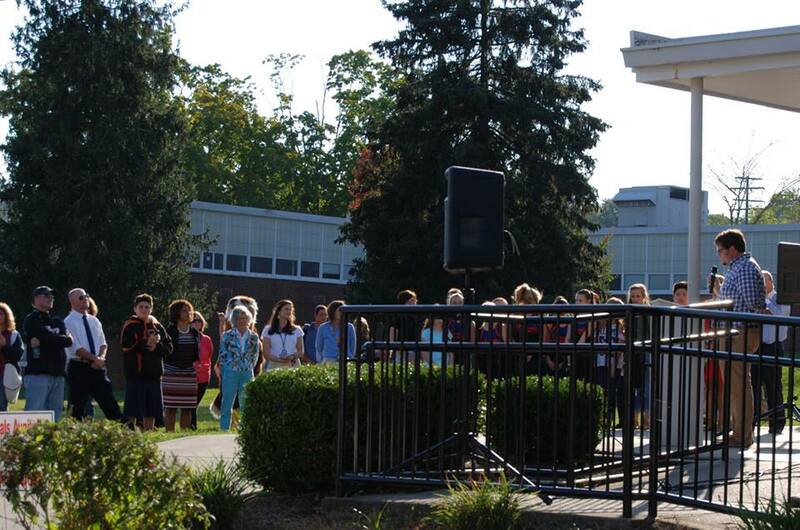 I hope those kids realize how huge this is (and remember to include it in their college applications). I know how difficult these things can be; well done! Thanks so much, Dan! It really was PERFECT. One of my students that helped with this came that night, and, with tears in her eyes, thanked me "for making me a part of history." My heart is just so full! Kevin, thank you so much for giving this event the recognition it definitely deserves. I am now extremely knowledgeable about this, & I only have you to thank for making me a more knowledgeable person on this subject. But seriously, thank you for bringing this to light. I will now let my friends & family know about this event in history. Thank you for reading, Cameron. I truly appreciate it. Thanks, Allie! I'm glad I could share this with you. This is wonderful stuff man. Can't believe I didn't see this before. Thanks, buddy. I truly appreciate it. Kevin, This is such wonderful news!!! I am so impressed that you and Amanda got this finished for all prosterity! Congratulations on a job well done! !